vv, how's the struggle with the habu pattern translation going? beverly, what happened to you? we haven't heard from you in ages! i've become completely obsessed with dishcloths. they're very portable and it's almost instant gratification and really cheap yarn works just fine. i did another one from mason dixon in 2 shades of green and a really light blue. it is incredibly cute. and last week i bought vogue knitting stitchionary. it's the pricest knitting book i've purchased, but it was just too beautiful to not come home with me. i knit another washcloth from one of the stitch patterns in there and i'm about 1/4 of the way through a fun dropstitch one that's also from the book. i got the book last week when andrea was visiting. vv, we only made it to one yarn store while she was here, that just doesn't seem right... but we did get a couple of hikes in. you and al should come back down some weekend and see the gorge. and one of joe's sisters (jennifer) with one of her kids (miles) is coming out to visit this weekend. miles is 4, so i think we will definitely be hitting the zoo. and we're going to the coast on saturday. they live in kansas so this will be the first time miles sees the ocean. should be fun, because joe can drive and i can knit on the way! i've also spun another skein of yarn since i last posted. it's about the same as the last one. i forgot to mention that i'm completely fascinated by habu, you know, the yarn made of paper, and paper with shredded stuff spun into it and wire and ... well you get the picture. so when i was visiting in portland with mims, i bought this kit. as you may guess from the photo, it's a little high maintenance. first off, the cones, THE CONES. at first, it looked so pretty, all wound up in the small spire, but for knitting, they were likes spires of chaos. but my lazy kate seems to have kept it in check. second, the paper, well, it's like knitting paper. the knitting of the thing is straight forward, but the actual making up the bag requires some sort of japanese-english translation. well, whatever. i'll figure something out. i'll let you guys in on my frustrations as it happens. you can probably figure this out but what you are looking at are my poison ivy medications, my signed copy of 'one skein' and the latest stripy sock yarn. - spend the night in the minneapolis airport because flight was delayed. - had to design a 64-page tab for the p-i. - had to go to the doctor because the poison ivy was making my wrist blow up like a ballon. saturday i went to visit mims in portland. portland has the *cutest* yarn stores. mims, you are so lucky. 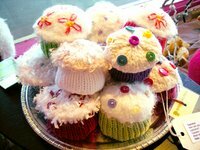 i took some pics at lint (the location of the plate of cupcakes.) i think it's possibly my favorite. it even had free temporary tatoos of their logo. and great music playing. and great yarn. see photo of terra. we also met leigh radford, and she signed my copy of one skein at knit/purl. those lovely knit/purl owners let me and mims sip champagne and munch on brownies while i sat and chatted with leigh. honestly, i thought there would be more people there, but i'm pretty happy there wasn't, cause leigh had time to tell me a little about how she got her start in designing for Interweave and what to do with some shibori felting balls i bought on a whim. and now it's really going to sound like i'm stalking leigh. she told me she was going to talk to the seattle knitting guild tonight. so i'm going. so if leigh radford mentions something about a short asian chick lurking two steps behind her, you'll know how to direct the police. i'll try and take some pictures tonight. i forgot to get a picture of her in portland. oh, and just so you know, mims' yarn in person is just FAB. F.A.B. i can't wait to see what she does when she dyes it!!!!! and also i dyed some more stripy sock yarn. i'll take a pic of it and post it tomorrow. if any of you find it interesting, its yours. so here's my first skein, it's about 60 yards. i navajo plied it yesterday. it broke a few times, but i just tied the broken ends together and kept plying. it's wool so i figure i can just knit something to be felted out of it and the knotted ends won't matter. i had a frighteningly good time plying it. watching the strands wrap around each other was completely mesmerizing. now come on, it's sunday, somebody give me the dish on maryland! lets see pics of all the new stash! i want the news! who's got the wireless-remote-blackberry-handheld-computer-thingy to blog all the fun from maryland? 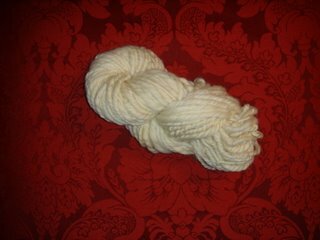 i do believe that i have achieved a modest spinning breakthrough last night and tonight. (drum roll here.) i am drafting relatively successfully. (okay, that was probably a bit of a let down for anyone reading this, but it feels like a darn bid deal to me.) before i was predrafting the fiber within a wrap of its life. now i'm drafting from a relatively thick chunck of roving. and last night i was looking at a catalogue (i don't know who's selling my name and address, but as long as it's to fiber sources i like it!) and realized that the metal prong-thing that came with my wheel is actually a lazy kate. at this rate i might even attempt plying before vv visits. I am so out of it, I didn't even realize Maryland was this very weekend. Todd and I are going out of town Thursday morning and returning Sunday night. That means I won't get to go to the VV party. I'm very sad about that. VV, how long will you be in town? I would really like to see you. Wish we could get together for a knitting meetup with all the old gang, since Marcy and I won't be in Maryland. Oh, and for those of you asking about what yarn I want in Maryland, I really don't know how I would pick something out without being there. But maybe I will give you some money for one really cool muffin/ball of fiber to motivate me in my spinning career. I finished the Somewhat Cowl last night, and it came out terrible -- for me. I made the smallest size, and it's way too big for me. I had the correct gauge, too. The sleeves are baggy. It's shapeless in the middle. The neckline looks ugly. I can't even stand to look at it. It's a disappointment, as I had hoped to wear it to Maryland. But oh, well. I try to remember what my knitting guru (VV) told me once: It's not the product but the process that matters. I may just stick to knitting accessories from now on. 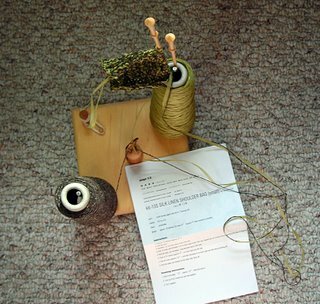 leigh radford is doing a book signing at a lys (knit purl) at 5 pm, may 13th. we can spend the 60 bucks on yarn instead of the class and still meet her! one more day till you head east? give everyone hugs for me and have a blast! so i have a little work to do so i can actually use the cashmere. but it was terrific discount, just so you know. wouldn't it be great if he had cashmere yarn? maybe we should hit little barn first? i will look it up tomorrow and send you a paypal invoice for the product. this is going to be the biggest dog and pony show we have every put on! around 20,000 skeins of yarn below wholesale and over three thousand pounds of fiber on special. look forward to seeing you there. i emailed the little barn guy trying to get an order for maryland and he told me he couldn't reveal the price for the festival but said the discount on cashmere was amazing. i was going to reserve a pound, but i've up'ed it to a pound and a half.